last night I gave a 5 minute version of my "etch your banana" talk at the Silicon Valley Innovation Institute. if Ian Shoales can pack everything about the meaning of life into one minute at the end of Philosophy Talk radio shows, then I can do this. for most talks I do, someone gets an etched banana. 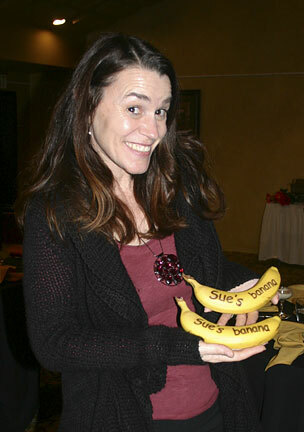 here's Sue Lebeck, Director of the SVII Innovation Society, with her banana. I gave her a second one to share with someone who doesn't have a banana. if you would like a little levity at your next meeting through seeing what's possible with a laser cutter/etcher, feel free to contact me about my free laser talks. This page is an archive of recent entries in the Talks category. Products is the previous category. Techie report is the next category.